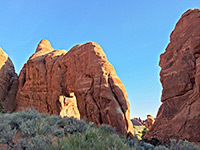 The major features and viewpoints in Arches National Park are concentrated within one mile of the scenic drive, so most trails are quite short and there are no extended back country routes. 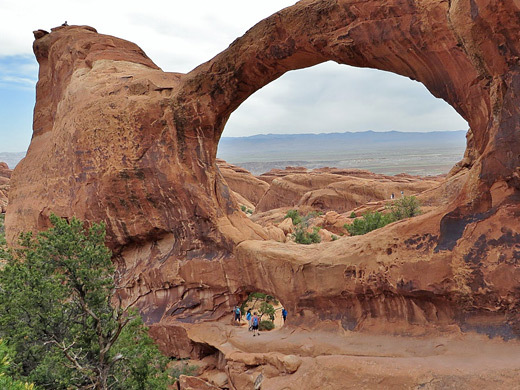 The longest is the loop path to Devils Garden, a wonderfully varied area of arches, fins, canyons and slickrock beyond the far end of the road, and which is 6 miles along the direct route or 7.5 miles including various spur trails. The start of the path is gravelled, flat and easy, as far as Landscape Arch, the destination for most people; beyond this the route is rougher though more interesting. 17 views of formations in Devils Garden. Arches overview map, topographic map of Devils Garden. The path starts along a ravine between two vertical blocks of sandstone, then quite soon a turning on the right leads down a slope to the first two arches, Pine Tree and Tunnel. The main trail continues straight and quite level to the base of Landscape Arch, 0.8 miles from the carpark, where the gravel portion ends. Until recently visitors were allowed to walk under and around the arch but several rockfalls in the last few years have caused the area to be closed and it would seem that the arch will not survive much longer. 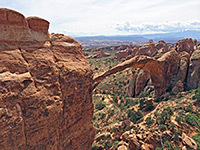 The huge 290 foot (88 meter) is little more that 3 feet thick at its narrowest point and has several lengthy fractures. 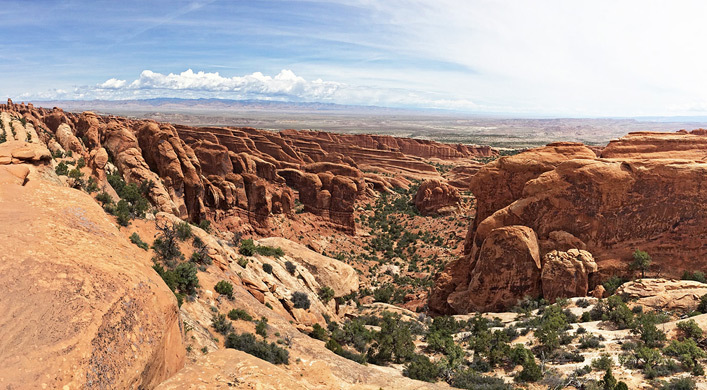 Beyond Landscape Arch the terrain becomes steeper and more uneven as the trail gains height and enters a maze of narrow, sandy-floored ravines between sheer fins and ridges. 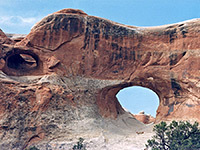 The next three landmarks are Wall Arch (formerly the 12th largest in the park, though it stands no more, after collapsing during the night of August 4th, 2008) beside the main path, then Navajo and Partition arches, reached by two short side tracks on the southwest side; from here, after an exposed walk along a narrow ridge, the path reaches unusual Double O Arch where one large oval span lies above a second, smaller one. Another side path extends a further 0.4 mile to a rock pinnacle known as Dark Angel beyond which the rocks fade away allowing fine views over a vast area of desert and mountains to the northwest. Double O Arch marks the end of the path, and the majority of people turn around here and go back the same way but there is an alternative return route along a primitive loop trail that heads northeast down Fin Canyon then south across a wilderness of slickrock and sandy washes for 3.5 miles, rejoining the main path close to Landscape Arch. This has some steep sections and is not always easy to follow but encounters great scenery and passes one more large arch (Private Arch, along a 0.2 mile side trail).